In keeping with Julian’s reputation for apples, the Julian Woman’s Club will hold its 11th annual Apple Blossom Tea on June 7, 2019, at its clubhouse. 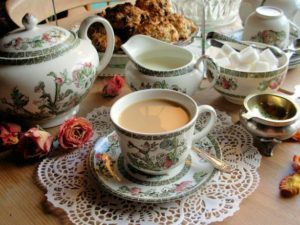 Edie Seger, a club member and owner of Julian Tea & Cottage Arts, will prepare the menu and supervise the preparation of food for a full English tea. We will be serving at 11:00 am, and again at 1:30 pm. Seating is limited in our small but very charming clubhouse, so reservations are required. Cost is $25 per person and reservations are required. Please complete the Registration, print and mail it along with your check to: Debbie Bainbridge, PO Box 127, Santa Ysabel 92070. Reservations must be received by June 1st, 2019. For reservations after this date or if you have questions, Call: Debbie Bainbridge, (760) 765-4702.